President Obama, speaking in Laos, was asked about Native American rights, and the Dakota Access Pipeline. Obama said he couldn't provide any specifics, and that he would have to get with his staff on this one. Most of his response focused on him praising his work with Native American Tribes. 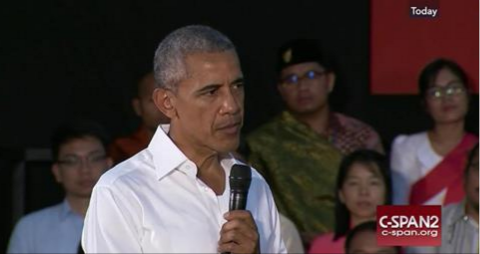 Obama was asked by a Malaysian reporter about Standing Rock and what he was doing to ensure the protection of ancestral land, the supply of clean water, and environmental justice. “I can’t give you details on this particular case, I'd have to go back to my staff and see how we are doing on this one," Obama said. It turns out, the Dakota Access Pipeline applied to the U.S. Dept. of Energy for permits in the spring of 2014 -- before Obama came to Standing Rock in June of 2014. 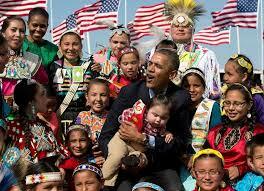 Obama was photographed with babies and promised to work together with Dakota, Lakota and Nakota for a brighter future. Although Obama rejected Keystone XL, a new pipeline was slyly permitted. This new pipeline, which includes Dakota Access Pipeline, was permitted in sections with transfer points, in order to avoid public detection and outcry. The new pipeline goes all the way from the Alberta tar sands to the Gulf of Mexico. The new pipeline had already been obtaining permits for one year, when Obama announced the rejection of Keystone XL in November of 2015. On Saturday, Dakota Access Pipeline bulldozers plowed into a burial area where chiefs are buried, and important cultural areas are located, according to court documents. Dakota Access Pipeline attacked Native Americans with vicious dogs and mace, as they tried to protect the burial grounds. Six people, including a pregnant woman and child, were bitten, and many maced. 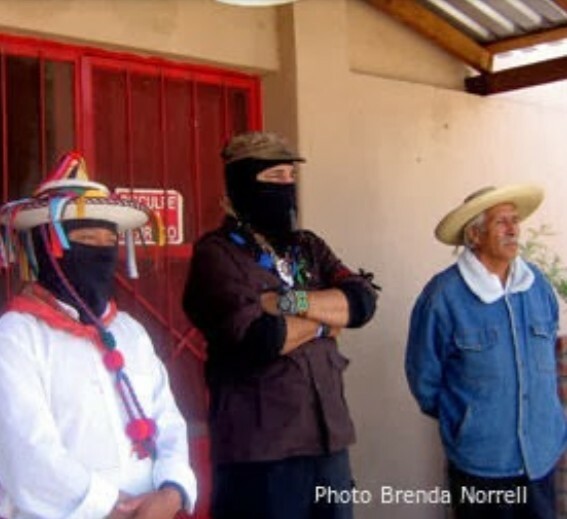 Democracy Now was present and broadcast the attack by the pipeline. 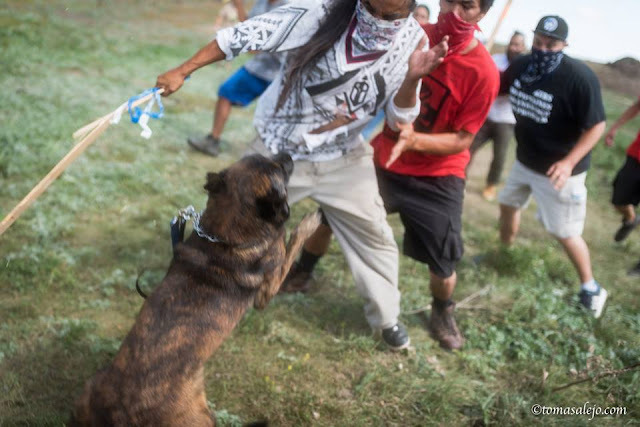 However, the Morton County Sheriff's Office released a statement of lies about what happened, blaming those who were attacked for violence, and falsely accusing them of having weapons. Many mainstream media outlets, who refuse to be present and cover the news, including The Associated Press, published the lies of the Morton Country Sheriff's Office without making any effort to ascertain the facts. 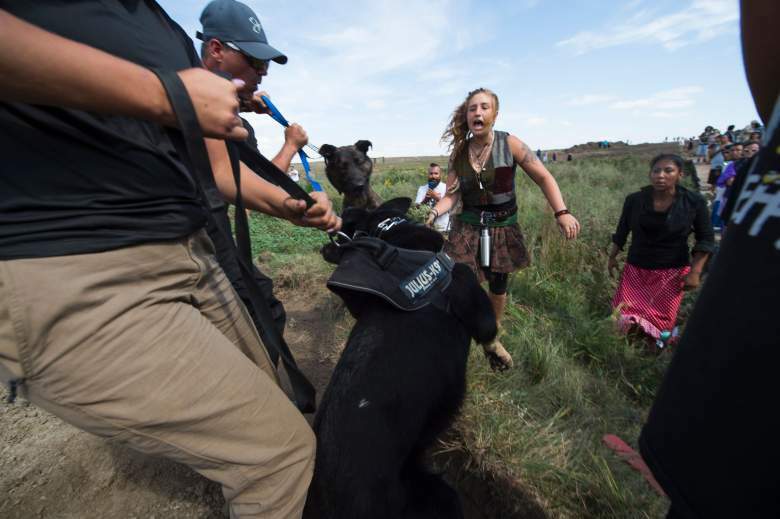 Photos above, Native Americans and supporters attacked by vicious dogs of Dakota Access Pipeline on Saturday. Photo 2 shows the blood of the burial place defenders on the teeth of the attack dog. dear ms. norrell, please keep us informed about how the little girl who was hurt is doing. I tried brendanorrell@gmail.com and got a failed delivery message, so update us on the girl's progress on your blog. We pray she gets well soon without permanent damage. If this were anyone or anywhere else, the dog's owner would face criminal prosecution.